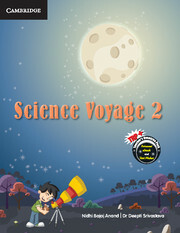 Science Voyage is a well-planned, graded, activity-based eight-level science series for school children. Science Voyage is a well-planned, graded, activity-based eight-level science series for school children. The series aims to help develop scientific temperament in the students by encouraging a spirit of inquiry through the use of concept-based presentations and visuals. The series is prepared in accordance with the latest NCERT syllabus and conforms to the vision of the National Curriculum Framework. The series is fully compliant with the requirements of Continuous and Comprehensive Evaluation (CCE).The series emphasises on a variety of scientific skills such as observation, investigation, research, analysis, planning, experimentation and communication to ensure in-depth and holistic learning. Unit Page: learning objectives and open-ended questions meant to develop learners’ curiosity. What I Know: warm-up exercise to refresh learners’ previous knowledge. Checkpoint: in-text exercises to propel self-assessment and learning. Activity: interesting hands-on experiments and activities to help understand key concepts. FactAce: interesting facts related to the concept. Vocabulary: meanings of difficult words. Key Words: definitions of important scientific terms. Summary: a quick recapitulation of the chapter. What I Have Learnt: complete revision of the chapter through well-planned exercises. Extend: extension of the topic to develop curiosity in students through a variety of questions.